"Are you the lady who likes old quilts?" The voice on the other end of the phone sounded impatient. "I've been cleaning up my mother's estate and I found these--want to buy 'em?" I gulped. "Well," I started, "I surely could look at them-". "Good," she declared, "I'll be right over!" And one of the shortest phone conversations ever led to me buying a quilt top that has become one of my favorites. The old quilt displays fabrics from 1890-1920 but I sewed two new borders on just to have sturdier fabric around the vulnerable edges. 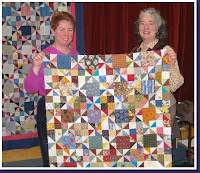 Now I teach it in a class and there are any number of smaller versions of the Swartz Creek Scrap Quilt running around. 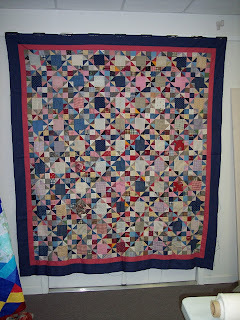 The original quilt top was from Swartz Creek, Pennsylvania, a place that I can't find on any map. The quilt is quite a crowded combination of 4" squares, Four Patch blocks pieced from littler squares, and Pinwheel blocks. 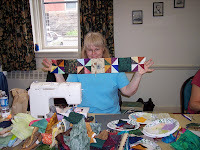 Lots and lots of Pinwheel blocks. Every other block is a Pinwheel. That fact starts to sink in as students work on the pattern in class. People send me pictures months-years-later after they've got their quilt tops done. I encourage them to personalize the pattern and they get creative with the borders. Elaine Dumler from Denver added applique borders for a sweet touch. I apologize for not identifying all the makers of these quilts. If the makers read this, please send me a corrective email and I'll gladly give you credit.